The Pentagon’s enthusiasm for drones has never been greater. 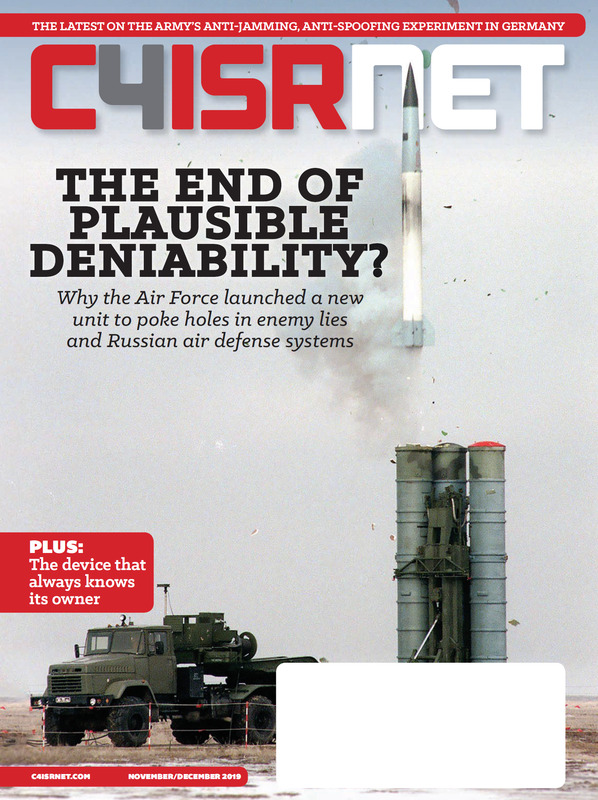 A new report published today by the Center for the Study of the Drone at Bard University found that in the president’s new budget request, the Department of Defense is asking for three times as many uncrewed vehicles for 2019 as it did in 2018. That’s 3,447 new drones, to be exact, but don’t expect the skies to go dark with Reapers anytime soon. Despite the numbers requested, the drone budget itself is up by only 26 percent. The Pentagon isn’t just buying more drones, it’s acquiring a whole range of new systems, for everything from undersea surveillance to cheap scouting quadcopters to lasers designed to shoot down the cheap quadcopters of adversaries. The drone century is only just beginning. That $9.39 billion breaks down into $2.6 billion for the Air Force, $3.7 billion for the Navy and the Marines, $1.7 billion for the Army, and almost $1.3 billion across the rest of the Pentagon. Part of the shift in spending from Air Force to Navy is the nature of the drones purchased. When it comes to the iconic drones of the last administration, long-endurance machines like the MQ-9 Reaper and the RQ-4 Global Hawk, the Air Force is simply buying fewer than it used it, and what units it does buy are mostly replacements for aging or lost models. These legacy systems still dominate the budget: maintaining and operating existing machines still costs a pretty penny. In the margins around those big-ticket items, there’s a quiet shift taking place: a new emphasis on cheap, small drones. Quadcopters show up in every service except the Air Force, as well as Special Operations Command and the generic overall Pentagon budget. There’s $140,000 to buy 100 quadcopters for CTEF, or the Counter-ISIS Train and Equip Fund. 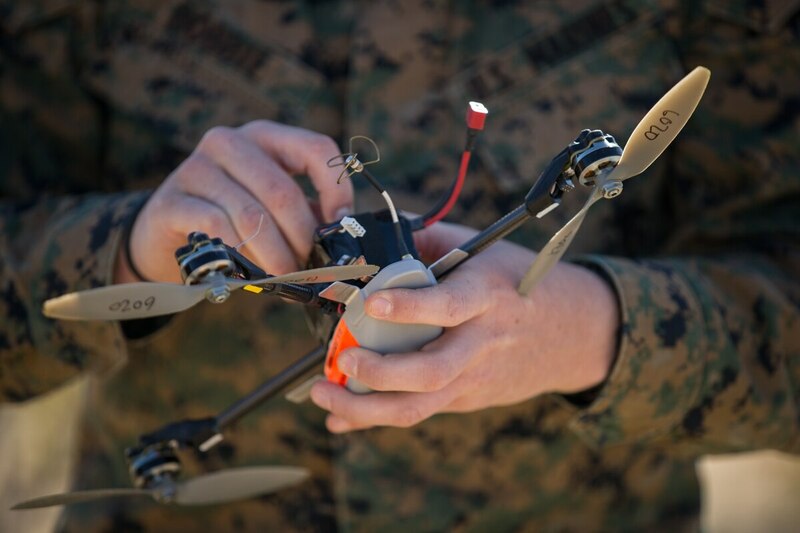 The Navy and Marine Corps is asking for 200 InstantEye quadcopters, likely part of a “quads for squads” program. SOCOM wants 50 quadcopters listed as just “quadcopter,” as well as over 500 NANO VTOL drones (which are likely to be quadcopters) and 160 Micro VTOL drones (also almost certainly quadcopters). And the Army’s asking for 1084 drones as part of the Soldier-Borne Sensor program, which wants to put palm-sized quadcopters at the disposal of infantry. Altogether, that’s over 2,000 quadcopters of various models. Excluding the ones requested by SOCOM, which are grouped together with multiple varieties of larger drones, the Pentagon is asking to spend about $30 million on small 1,400 drones, for about the same price as two MQ-9 Reapers. Summary of the FY 2019 budget request for drones. Besides putting small drones into the sky, the Pentagon is also looking to spend more on tools to shoot drones down. In this space, the Navy is also looking to fund multiple counter-drone laser projects, but somehow real-life lasers aren’t even the biggest ticket item. The Department of Defense is asking for $1.07 billion on counter-drone tools in this budget, up from $453.9 million last year Much of that increase is in the Army’s “Low-slow-small Integrated Defense System” (LIDS), which appear to be some form of guided missile. Speaking of guided missiles, the Center report notes that the Army and Navy are asking for a combined total of 1,618 Switchblade loitering munitions. Related to both cruise missiles and drones, they don’t quite fit in either category. Gettinger noted that technically the Switchblades are included in the budget for missiles, making them closer to Hellfires than Reapers. Complicating it further, the Navy’s submarine-launched Blackwing drone is based on the Switchblade body, though it’s formally billed as an ISR platform, rather than a weapon. Specifically, that’s $40 million under the “Robotic Combat Vehicle Experimental Unit Prototypes project,” which wants to see robots accompany human-containing vehicles into battle. It’s hard to say how much of this request will make it through Congress. Yet as a statement of where the Pentagon wants to go, it’s an invaluable guide. 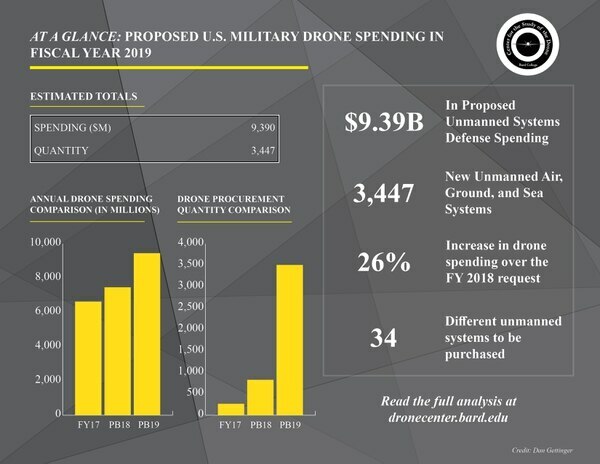 By piecing together the whole of the drone budget, the Center finds a pivotal moment, where drones are smaller and more numerous and better dispersed, and distributed too among boats and in submarines and driving on the ground and carried in backpacks. Drones are a big part of how every service sees war in the future playing out, and from cheap scouts in the field to elaborate lasers built to shoot down hostile drones, the notion that drone war is a separable part of warfighting can largely be laid to rest. Drones are an evergreen part of war, now.